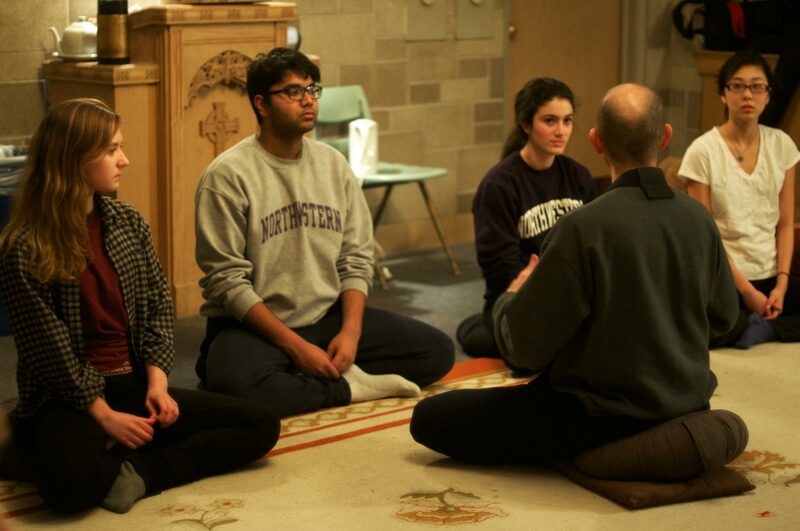 Students seek Zen calm amid Northwestern stress. The lights dim as 23 students sit in a circle on small cushions atop an orange and tan rug while two gongs stand nearby. They wear comfortable attire - flannels, sweaters and jeans — and sit with their legs folded against the floor, focusing on the tension in their backs. This position is the Burmese pose, one of five positions typically practiced at the Northwestern Zen Society meetings. Founded in 2003, the Zen Society meets every Thursday evening in the Parkes Hall Oratory to practice Zen meditation. It is hosted by the Chicago Zen Center (CZC), with guidance from CZC Director Yusan Graham. The goal of Zen practitioners is to reach enlightenment by meditating and searching within themselves.The students who come to the meeting are not all practicing Zen Buddhists. Many meditate to try out Zen, relieve stress or achieve other internal goals. Medill freshman Nicolas Rivero recently attended a Zen Society meeting for the first time. Learning more about how his thoughts work intrigued him. Zen is a unique sect of Mahayana Buddhism that does not focus on scriptures or rituals. Rather than using rationality to understand life, practitioners try to separate themselves from logical thought and focus on material detachment and meditation. Although there are two sectors of Zen Buddhism, Soto and Rinzai, the CZC uses a combined version of the two that simplifies Zen down to its basic principles. Buddhists espouse other spiritual paths, and many in the West see it as a philosophy that can be practiced in conjunction with other religions. However, Graham says there is no hesitation to see Buddhism as a religion in the East. CZC Priest Shodin Geiman was raised Roman Catholic before he became interested in Zen Buddhism. He considered becoming a Catholic monk earlier in life but says he felt detached from actual religious practice when attending church. Although affiliated with Zen, the CZC is more of a resource than a church for its practitioners. It has ceremonial events like temple nights, but most of its services are group meditation sittings where people can explore life on an individual basis. Graham says they’re not necessarily trying to convert students to Buddhism, but rather trying to give them the opportunity to explore Zen. The people who come to CZC are looking for support and clarity. Weinberg junior Jonny Schild is the president of NU Zen Society. He considers himself a Zen Buddhist and a former follower of Vipassana, a type of insight-based meditation. Schild has attended Zen Society meetings since the middle of his freshman year when an older friend suggested it to him. Regardless of how beliefs and practices differ regionally, Graham believes Western mindfulness is a great trend. Geiman describes meditation as similar to athletic training, something individuals need to work on at their own pace, even if it’s not something they initially enjoy or succeed at.